Congratulations on your engagement! Thank you for checking out my free wedding planning crash course. I put this guide together because, over the years, I’ve noticed that the most stress-free and fun weddings that I photograph all have a few things in common. Over the next few minuets (or really however long it takes you to read! ), I’m going to share those things with you. Below, you will find several tips and I hope you find the information helpful. If you enjoy these tips, I’d love to hear what you liked best. Please feel free to pass these tips on to anyone you know who might enjoy them! Alright, let’s get started with tip #1! Let’s face it, planning a wedding can be tough! My best advice for coordinating your day and ensuring all goes right is to HIRE A WEDDING PLANNER! A wedding planner can make things smooth and seamless, and let you relax and take the day in! Don’t consume yourself worrying about the details and making sure everyone is following the timeline. Let someone else keep you and them on track. A wedding planner can not only focus your wedding day vision and ensure that you’re hiring trustworthy vendors but based on these things and experience, they can develop a timeline in conjunction with your photographer so that your day is exactly what you want it to be! Whether it’s you or your wedding planner, or perhaps it’s a collaborative effort of both, you’ll want to develop an outline and fill in the details as you go. Some photographers, like myself help out the bride and groom and create a wedding day timeline as well. Here’s a general idea of what your wedding day (photo) schedule should ultimately look like; this will vary based on the dynamics of your day. For the Bride: A trial run of hair and makeup always helps to estimate how much time you will need to look your best. To be sure you have enough time to enjoy and relax, add another 30-40 minutes to this for a safety net for any issues that could come up, and if nothing comes up, then you’re golden and you can just sit and relax! You’ll also want to include about 20-25 minutes for getting your dress on. Some wedding dresses are tricky and take a bit of practice and time to get zippered, laced, or buttoned properly. Average time: 1.5-2 hrs. For the Groom: Most weddings involve some sort of group activity early on, like golfing, shooting pool, etc. Afterwards, we will get some details of the grooms finishing touches, shoes, jacket, cufflinks. These little pieces will help tell your story, documenting groom prep is essential. We will finish up with a few portraits of the guys together, fun & formal! Grooms and party usually take a little less time than the bride and bridesmaids, but obviously, this can vary. Average time: 1-1.5 hrs. The next phase of your outline can really change here. Consider if you want first look photos with couples portraits. Another common photo request to consider for brides is if you’ll want first look photos with your father or family. These variables could really change your timeline. Average time: 1-2 hrs. Keep in mind things like bride/groom gifts and notes as well as any other personal touches that are unique to your day. Please let me know if you have any questions! Now we’re going to move on and cover the ceremony and reception. Over the past couple of years, I’ve noticed a trend. Ceremony services are getting shorter and shorter. That’s not to say that they are less important, couples have just been focusing more on the aspects that are truly meaningful to them. Your officiant will give you more information on how long all this will take. Plan for 15-30 additional minutes to allow your guests to exit the ceremony, and 30-45 minutes if you’re planning on having a receiving line. Ceremony Average time: 15 mins-1 hr. Cocktail hour – Depending on what you did before the ceremony (first look/ no first look) can change your timeline here: couple portraits/family & bridal party photos. Average time: 1hr. Guests move to dinner: This time will include Introductions, Toasts/Speeches, and the first dance. Average time: 30 mins. Dinner: Typically you will go with your photographer during a portion of dinner to do sunset photos. Average time: 20-45 mins. A bit of dancing usually occurs before Cake Cutting & Parent Dances (Average Time: 15 mins..) Dancing picks back up after and depending on what you would like for your day will end the night. A typical evening wedding can end anywhere from 10pm-2am. I hope that you’re finding this information helpful! Remember, this is just a guideline and the specifics will differ from wedding to wedding. Planning is key to less stress on your big day, so be sure to use your wedding planner to their full potential! When you picture your wedding day, you picture the best day ever- right?! Years from now, when you look back at your video and photographs, you’ll reminisce about just how perfect your wedding was. Well until you come across picture after picture of your guests leaning into the aisle to get that “perfect shot” on their iPhone. And when you watch the video, everyone seems more concerned with making their own picture memories then enjoying the celebration that you worked so hard to plan. This doesn’t seem like the best way to remember your wedding right? Unfortunately, in our social media driven society, we are seeing this at weddings more often. Everyone wants to get the perfect snapshot for Instagram or their Snapchat. Meanwhile, you already had this planned out by hiring the best photographer and videographer out there. Someone who will produce quality pictures and videos that all your guests (and you!) can share as much as they want. To do this, couples simply need to make it clear that they would like for everyone to put their phones (and iPad’s – yes I am serious, this happened!) away and be present for the joyous moment that everyone came together to celebrate, it will create a much happier day and your wedding album will be free of iPhones. Ok, so this is semi-selfish but definitely worth mentioning! Having an unplugged ceremony also makes the photographer’s job much easier. A wedding ceremony is filled with little moments that require focus, and anticipation by your photographer. We only have a fraction of a second to capture that moment your groom sees you walk down the aisle, or the moment you wipe the tear off your cheek, grandpa’s proud smile, or your flower girl giggling when you kiss. There’s a lot that goes through our minds when we are positioning ourselves, checking our settings for optimal exposure, angles, and composition. Having to adjust our stance or work around people that hold their phones out last minute, makes it really easy to miss those memorable shots. Wouldn’t you rather have the professional image down the road? Another advantage of asking your guests to be present is that you won’t have a ton of grainy, unflattering pictures come out on social media as the first impression that everyone who wasn’t at the wedding is going to see. The first photo of the two of you as a couple will be a polished, professional image that highlights the day and you! I totally understand that people want to see your wedding ASAP on social media. That’s why I offer instant teasers for anyone who has an unplugged ceremony. This means that I’ll process and edit a teaser image immediately after the ceremony (seriously, even before the reception begins!) and post it online for all the world to see. Everyone is going to be blown away by how stunning you look AND how quickly your photographer made your images available. There you have it. These are the reasons I stress having an unplugged ceremony. As you can see you won’t be missing out on anything… well, besides the iPhone cluttered pictures! Your friends and family have probably warned you that your wedding day will be a blur. Even when everything goes off without a hitch, there will parts of the day that you barely remember, details that you didn’t notice and moments that you might not have been a part of. Don’t worry though, I’ve got you covered! One of my favorite things is when couples receive their wedding images and thank me for capturing things that they didn’t see. Your best friend tearing up as you walked down the aisle. The look on your parents faces as you said: “I do”. Your grandmother laughing during the toasts. It’s not just the sentimental moments! I’ll capture all of the tiny details that you spent months planning but may not have fully taken in on your wedding day. I won’t just capture them, I’ll create beautiful heirloom keepsakes with them that your children and someday your grandchildren will be able to enjoy. 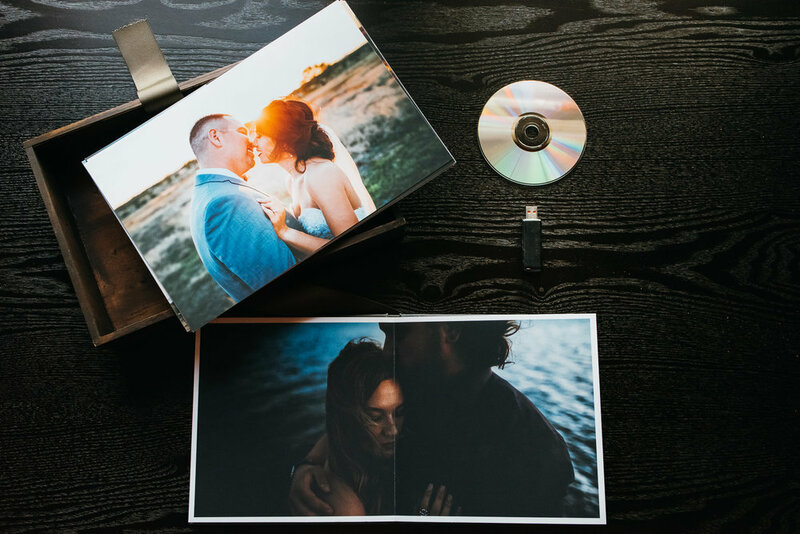 I offer beautiful custom designed albums and fine art prints that will be treasured for generations and that will take you right back to your very special day. I’d love to talk to you about your wedding day and show you some of the beautiful products that I offer. Just reach out and we'll chat! Which of these will be readily accessible for your children or grand children in 15+ years? There are a lot of reasons to have an engagement session. Not only do they give you images to announce your engagement in style, but an engagement session is the best way for us to get to know each other. You get to see how I work and I’m able to get a feel for your natural chemistry and figure out how we can tell the absolute best version of your story in a way that will last forever. Couples who’ve worked with me before their wedding, go into the day feeling confident that I will capture their day perfectly and they are also more relaxed and comfortable in front of the camera. The entire experience from session planning, wardrobe styling, on-location shooting, right through the product selection and design process is exciting and fun. I love what I do and can’t wait start planning a meaningful and special engagement session with you! I hope that you found my tips for having a stress free wedding day helpful! If you do, please feel free to pass these tips on to anyone you know who might enjoy them! Wedding planning, and sometimes even the wedding day, can be stressful but it doesn’t have to be. All of the tips that I’ve shared are based on the experience that I’ve gained from shooting dozens of weddings each season. I’ve seen it all and am confident that following these tips will help make your day go smoothly. If you’d like to talk to me more about your wedding day, or hear about some of my favorite local locations for engagement shoots, just reach out, I’d love to chat!